Well can you Adam and Eve it? It's that time again, for me to share my Weekend Wonders with you. The weeks are flying by and Spring will soon be here, YAY! I've gone a little skincare mad and dug out my Clarisonic Mia, I'm giving it another whizz. I'm sure you all don't need to be bored to death about it. It's a one-button sonic cleansing brush...a giant electric tooth brush basically! I like to use a cleanser which foams/lathers up well, I find it works better that way. I have tested the Liz Earle C&P with it and some days it seems to work and other days not so much. 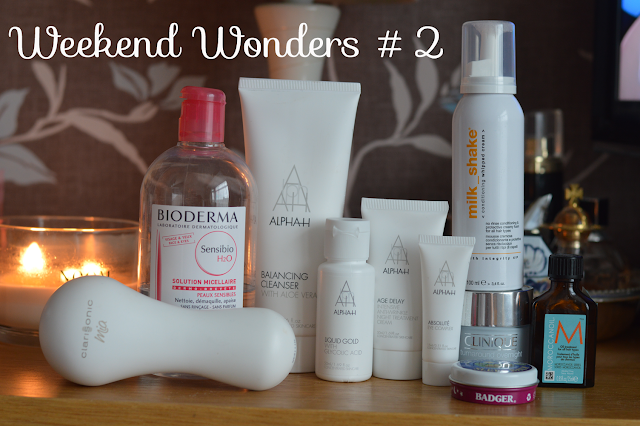 I would love to know if you have a Clarisonic and what you're favourite cleanser is when using it?? 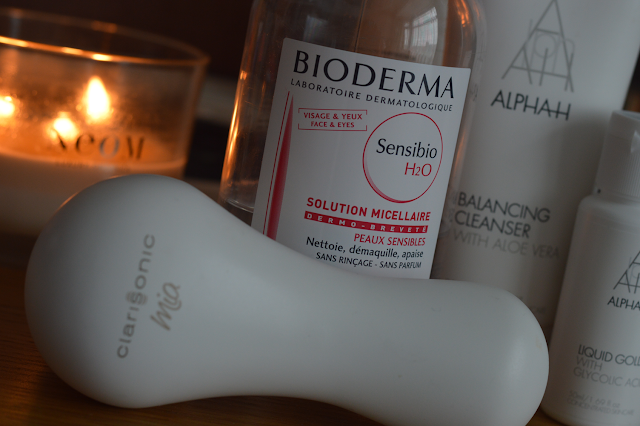 The next product which I've been using and loving is the fabulous Bioderma Micelluar Water, this is part of the sensitive range- Sensibio. In case you've just surfaced from hibernation Bioderma will be launching in the UK very soon, hopefully Spring time! WHOOP WHOOP! I am so excited, I'm really keen to try this in the green range, combination/oily skin type. 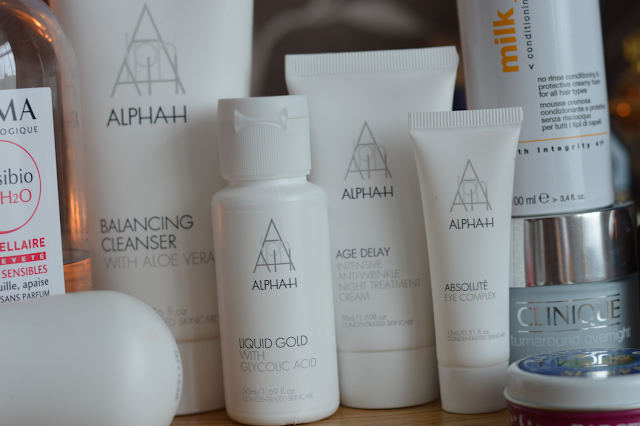 OK so as you can probably tell I've gone a bit skincare mad this week/end, I have been trying Alpha-H for the very first time. It's been very exciting especially after reading and hearing so many positive things about the brand and their products. I will be blogging about the products in a separate blog post very soon so I won't go into much detail here. All I will say is FAB...the four products I've been trying is the Balancing Cleanser, Liquid Gold, Age Delay Night Cream and the Absolute Eye Complex* and they've all been a pleasure to use. The other products which have been working wonders is the Milk_Shake Conditioning Whipped Cream*, this has become a staple for me since having a fringe cut in. It smells yummy and you only need a small amount, I use a little bit just for my fringe before blow drying. It's actually a leave-in conditioner which is in the form of a foam. Once hair is almost dry I use an oil, I don't have a firm favourite at the moment but the one which has been used recently is the popular Moroccan Oil. The scent is amazing and it's like pouring liquid gold onto your hair. You need a very small amount. 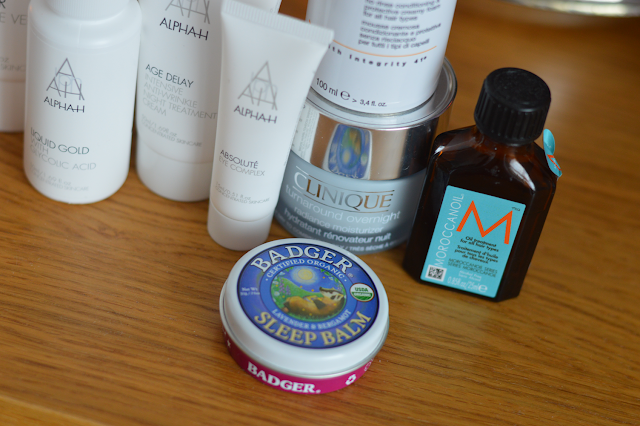 When I've been settling down to bedtime I've been relying on the Badger Sleep Balm* to help me settle and relax. The mix of rosemary, bergamot, ginger, balsam fir and lavender help you relax and clear your mind ready for you to fall asleep naturally. What wonders have you been enjoying this week/end? Ah some lovely products. I got the milk shake conditioning treatment with Glossy Box a while back and its waiting to be tested. I think you have inspired me to try this tonight! oohhh have you tried it? I love the smell! I've had a hectic week I think I might have to invest in these for a future one to make myself feel better. Great post! I ve been needing to see a post like this to inspire me ! . i have just bought the boots version of the clarosonic i hope its just as good as i can't stretch to the mia! I've heard good things about the Boots version, how are you finding it? Lovely products :) Really want to try the liquid gold! Apropos cleansers and the Clarisonic, I haven't tested it with a lot of different cleansers yet, but for now I'm using it with Dermalogica's Clearing Skin Wash (it's a creamy foam cleanser for acneic skin) and it works great, and I don't think it would work any worse with their special cleansing gel. The Alpha-H balancing cleanser is lovely.